you guys. do you know when i started watching football? saturday, october 23, 2010, stanford v washington state. i had just finished reading "the big short: inside the doomsday machine" by michael lewis (recommended) and had just cracked open "the blind side: evolution of a game"--not because of the movie, not because i even like football, but because i like lewis (i also highly recommend "moneyball: the art of winning an unfair game." i don't like baseball, but i've read this book twice.) i wasn't particularly interested in reading "the blind side" because i knew next to nothing about football, and didn't really spend the time to figure out why i disliked it. but as i got into the book, i read something that made me believe that the defense is always out to kill the quarterback. is that true? because in the NFL, it really seems true. where is the sport in that?? ANYWAY. back to the stanford game in october. i had the game on because i lost the remote and just needed background noise. and then the announcer said something i had never heard in a game before. he gave the grade point average of the player. andrew luck--team quarterback, majoring in architecture, with a 3.5 grade point average. i looked up. is this normal? or is it just because it's stanford that you get the GPA? anyway, i thought "golly, i hope they don't kill the qb with the good grades." and the more i watched the game, the more i realized that college ball was far more interesting to me than pro ball--i could follow the game, understand the plays, and there was the sense of sportsmanship i had previously found missing, even if yeah, they sometimes want to maim the quarterback a little. so now i watch football. but only collegiate, mind. i still don't know when the super bowl is, but apparently it's soon. and there are a bunch of recipes online for people getting ready for superbowl parties. 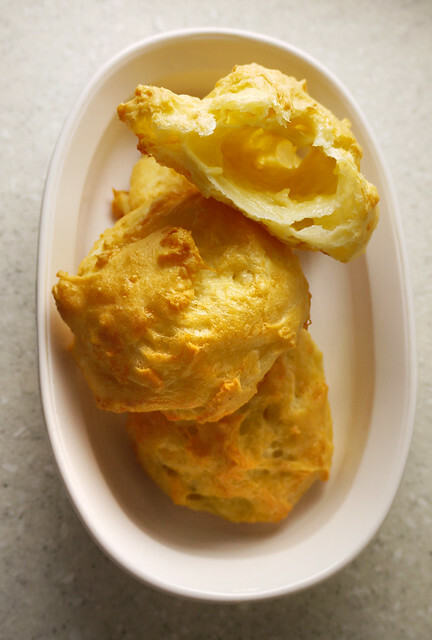 chef ludo lefebvre (you know, this guy) offered up a "cheese puffs" recipe on daily candy. 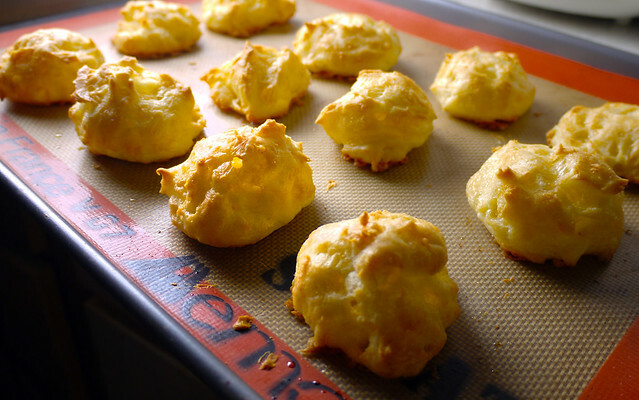 these cheese puffs are actually gruyère gougères, a sort of cream puff shell loaded with gruyére cheese. they are light, puffy and hollow--slighty crispy, slightly eggy, and nicely flavoured by the nutty sharpness of the cheese. you could probably eat a whole batch of these on their own, straight out of the oven. or even split and fill them--if you want to go a classic '70s cocktail route, try crab or tuna salad, or, if you want to do elevated comfort food, maybe a little prosciutto and strawberry preserves for an upscale take on a monte cristo sandwich. if you are going to get your su'bowl party on, what are you going to serve? where does cheese puff fall in the realm of football party food? once again, a link to the recipe. --used the second set of ingredients given in weighed amounts, instead of volume. --didn't use an electric mixer at any point, just a wooden spoon. --used 1/8th of a teaspoonful of kosher salt instead of a pinch (technically, 1/8th is two pinches). --follow the times carefully--you really do need to mix and dry the dough for up to ten minutes. --if you drop the dough by spoonfuls, a heaping teaspoonful will yield about 3 dozen, and take 20 minutes in the oven. if using heaping tablespoonful, you'll get approximately 1 1/2 dozen and it will take approximately 30 minutes to bake (check five minutes prior). 1. food. i have a love/hate, love/indifference relationship with it. 3. i like you. i really do. which is why i am going to try to shift the current hate/indifference mode to L-O-V-E, and embrace the foodie and blogger within. 4. there are too many food franchises coming to the island, i hope all the new folk on island will not stick to the frozen, salinated mass-marketed option. so this year i will try to blog about more local restaurants and what can be offered on a non-microwaved basis. 5. i might actually cook this year. 6. i like guys in suits. especially if they are adroit and adept at what they do. 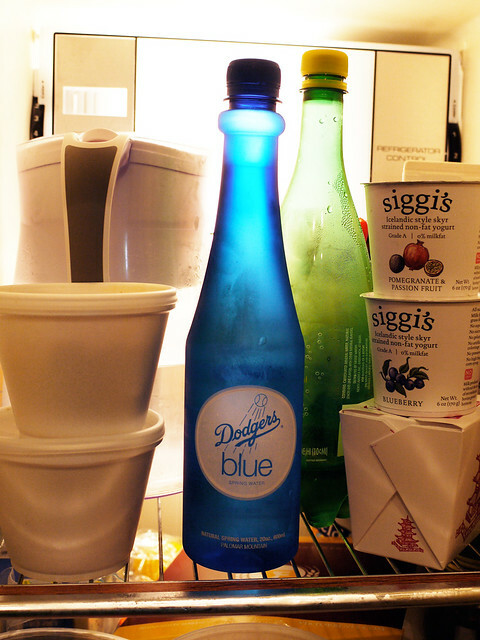 these are the contents of my fridge, so as you can see, there might be an easing-in period. see you soon.